1978: First model NS-10M released, intended for home hi-fi usage, described as "sealed system, bookshelf" type ("密閉方式・ブックシェルフ型"). Designed by Akira Nakamura, who also oversaw the later models, as well as the groundbreaking NS-1000M. Early 1980's: NS-10M gains a reputation as a nearfield studio monitor, first in Japan, and then elsewhere. Names often associated with this include Bob Clearmountain, Chris & Tom Lord-Alge, Nigel Jopson, Rhett Davies, Bill Scheniman, Grag Ladanyi, Andy Wallace, and others. 1987:Yamaha capitalize on the NS-10M's popularity as a studio monitor, and release the NS-10 STUDIO, NS-10M PRO, and NS-10MC models, which addressed some of the issues engineers had been having with the original model. 1993:Yamaha release the NS-10MX model, with magnetically shielded drivers. 1996: The final model, NS-10MT ("T" for "theater") is released, with increased wattage and a bass reflex port. 2001:Yamaha cease production of the NS-10M line, citing difficulty in obtaining the paper for the mid-bass drivers. However, the continued availabilty of spare replacement parts (including the driver in question) leads to some congecture as to the real motives. 2001:A research paper is published by the University of Southampton which shows scientific reasons why the NS-10M had been favored by so many expert engineers. 2006: Yamaha release the Nakamura designed MSP STUDIO series of powered reference monitors to "carry on the tradition of the NS-10M STUDIO monitor". 2007: Yamaha win the Technical Grammy for the impact their recording products have had on the industry, particularly the NS-10M series. 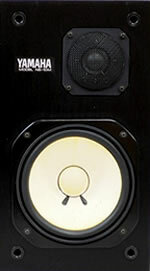 NS-10M speakers have the model name printed under the "YAMAHA" logo. NS-10M was the original 1978 model. Later models have PRO, STUDIO, MC (etc) written in addition to "NS-10M".